“By heavens, Joe, but there are great men in Ireland still”: Commandant Joseph Barrett (1888-1971) by Dr Paul O’Brien. A talk about the recently discovered Archive of Joe Barrett of Kilrush and Darragh, Ballyea. 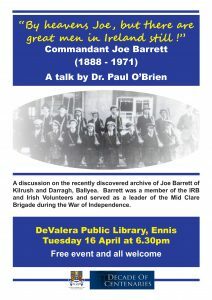 Barrett was a member of the IRB and Irish Volunteers and served as a leader of the Mid Clare Brigade’s Flying Column during the War of Independence. Paul will bring some documents from the Archive to the talk.